Oh that pesky little government is at it again… LOL. Certainly I’ve heard it all when it comes to politics in general. But you’d be surprised to know that the laws effecting R22 Freon production now (2016 and beyond) were finalized and signed by the USA in 1987 via the Montreal Protocol and ratified in 1988. The Montreal Protocol has been amended only 4 times since 1987. This agreement was an international agreement that has been signed by 197 countries. So why are you just now learning about this now if it happened in 1987? Part of it was to give time to come up with a new refrigerant to replace the old bad one. There are many refrigerants, all with varying properties to one degree or another. Some refrigerants make poor choices due to flammability concerns, others may not distribute oil thru the system properly and cause reliability concerns in regards to the break down of the system compressor. There are many more concerns than these but to keep this short I will stop there. As of 2016 there is no ‘approved’ drop in replacement for R22 Freon for high temp application otherwise known as Air Conditioning. Choosing an unapproved refrigerant will void ‘ANY’ manufacturer warranty, increase utility cost to run the system, reduce capacity of the system, cause the system to not cool properly in heat wave conditions, cause the compressor to fail prematurely due to improper oil return to the compressor. As of 2016 there is only one proven refrigerant for the future and the name of this refrigerant is R410a. It is sometimes improperly referred to as Freon or a more popular proper trade name it is called Puron. R410a refrigerant is not a drop in replacement for R22 Freon. Refrigerants can not be mixed and work properly, nor can you use R410a in a air conditioner that was designed for R22 Freon, it simply will not work ‘reliably’. The AC system must be replaced with equipment designed to work with R410a. Air Conditioning systems are engineered and designed to operate with a specific refrigerant. For reliable operation of the AC system one must know what they are doing and use the appropriate refrigerant for the system in question. There are many unscrupulous vendors and those that claim there are some refrigerants that can be used to replace R22 Freon. When it comes to the high temp air conditioning application these claims are false. The nature of a con game is something that will ‘easily’ solve a problem. I’m sure you’ve heard the saying… “if it sounds too good to be true… it probably is.” But yet people over and over again fall for these snake oil AC repairs. The notion behind these so called remedies is by giving you a cheap price up front. The system may run for a few months if you are lucky and probably not much longer than a year depending on a multitude of factors like loads on the equipment, line set length, age of the equipment, the heat load the system is running in and so on. Your AC will not work without the compressor. That is a major component so now you’re most likely looking at a new air conditioning unit when this part fails. An air conditioning system (just about any brand) is a 15 year appliance when installed and maintained properly. If you decide to play games with it, try to cut corners, try to reverse engineer things like using the proper virgin refrigerant the system was designed for as well as proper installation procedures it is unlikely to make it past even a few years without some significant problem. There is special equipment required to be able to install an air conditioner properly. If you use an unlicensed person to install your system there is a good chance they don’t have the proper equipment to install the AC system properly. How will you know for sure that they do or don’t have all the tools and materials needed to install the AC system? An improperly installed air conditioning system is the last kind of mess you want to have to deal with in your home. There are good reasons that manufacturer’s require licensed HVAC contractors to install the system in order to offer any warranty on the HVAC equipment. You know what the cure for doing it wrong is? To do it over again. You don’t want to do that do you? These words are intended to help you avoid making a serious mistake. The comfort in your home or lack thereof can wreck havoc on your finances. It is a financial decision and one you should not take lightly. Do it right the first time. Thank you for visiting with me today. I hope I gave you some valuable insight in this AC blog topic to help you with this challenging problem regarding R22 Freon and the change over to R410a Puron. Remember R22 Freon is going away. It is not coming back. It is in your best interest to upgrade your system by replacing it with an R410a engineered air conditioner. If you have a Freon leak in your evaporator coil you can replace the evaporator coil only but under this scenario you would continue to use virgin R22 Freon. As time gets closer to 2020 there ‘may’ not be any R22 Freon available at any price. There is no way to know for sure what will happen until it does. Using non compatible refrigerants is not recommended under any circumstances. The days of recharging an air conditioning system are pretty much over. The refrigerant leak(s) must be found and repaired. 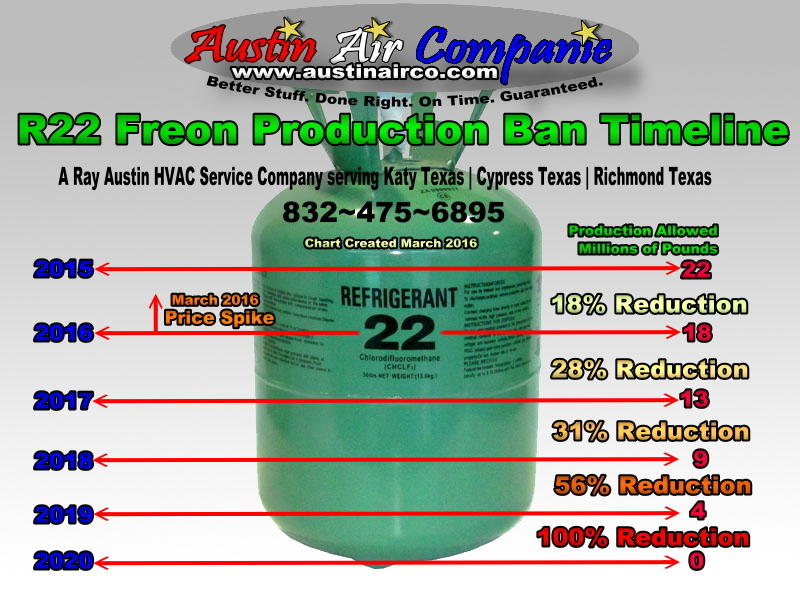 R22 Freon, the chemical coolant used in home air conditioners since the 1960’s is marking it’s final seasons until it will no longer be produced. The chart graphic above shows the year and the amount of R22 Freon allowed to be produced for that given year until January 1, 2020 when no more R22 Freon will be produced beyond that point. The production limits are set and controlled by the EPA and can be further changed at any time. The chart reflects the last Rule Change for production limits set by the EPA in October 2014. There will likely be small amounts available after 2020 as older reclaimed R22 refrigerant is turned in and sent off to reclaim centers that clean it of contaminants and resell it as virgin quality once it has been cleaned of impurities. However, prices will likely be very high and very likely strict limits will be placed on how much can be bought at one time. Once these strict limits are placed on how much can be bought it is very likely in my opinion that system recharges will no longer exist. Home owners and businesses will be forced to fix the leak(s) or replace and upgrade the air conditioning equipment to R410a Puron refrigerant. It is in your best interest to make plans now to either fix your AC system refrigerant leaks or come up with a plan to replace your AC system to the newer R410a refrigerant. R410a is the replacement refrigerant to R22 Freon. While it is the newer standard, it isn’t all that new. It has just taken a long time for it to gain acceptance because the pressures are higher and better service practices are required when working with it. Because of these requirements certain HVAC companies held off making the change, I think partly due to ignorance, partly due to laziness and even more likely the cost forced onto you the consumer because it’s in your best interest to replace the whole AC system when changing over instead of just one piece of the system. Taking short cuts with an R410a system is less forgiving than with an R22 Freon system. Like I said above R410a Puron isn’t new. It became available in the mid 90’s. It’s pressures are higher and the equipment that uses it had to go thru special processes to ensure the higher pressures could be handled appropriately. Additionally it requires the use of synthetic oil, where as most older R22 systems today use mineral oil. Your R22 Freon system will not work with R410a Puron. I’m sure you might have been thinking that. There’s more differences between the two systems than oil types and pressures. There’s also refrigerant flow which relates to capacity of the system. Your current AC simply will not work to recharge an R22 Freon system with R410a Puron. It will not work. Remember, the makings of a scam is something that is “too good to be true.” Be smart about it, you will be glad you did. If you would like to know more about this subject you can watch several videos I’ve made on the subject as well as a lot of text on the subject since 2009. You can click the link below to open that page from my main website. I hope you have found this information before you made a costly mistake. I have installed as well as retrofitted countless systems over to the newer R410a refrigerant for years now. I’m sure I could do the same for you and your family. Thank you for visiting with me today! I hope your day is a comfortable one. My name is Ray Austin. I am the owner and operator of Austin Air Companie, a HVAC Service Company serving Katy, Texas | Cypress, Texas and some surrounding areas. I am a Texas Licensed HVAC Contractor with over 20 years experience in Air Conditioning and Heating Systems. I hold an AOS degree in HVAC/R, EPA universally certified to handle any refrigerant and NATE certified in HVAC installations and repairs. Better Stuff. Done Right. On Time. Guaranteed. This blog post focus for Air Conditioning Repair Cypress Texas is about what the difference is between an Air Conditioning Technician and a Licensed HVAC Contractor in the state of Texas. The main purpose for this blog is that you the home owner have a big decision to make if your AC system breaks down this summer. Whatever decision you ultimately decide upon could effect you and your families comfort in some profound way. Just picking an air conditioning company based on what seem as favorable terms often thrown around within the HVAC industry without factual checking isn’t really what it’s cracked up to be when you’re talking about one of the most expensive systems you operate within your home. You pay for this system repeatedly via your electric bill, repairs made to the system and eventual replacement of the HVAC system. The difference typically comes down to experience, design and service quality. The truth is when it comes to an AC technician there is no real reliable way to discern how much experience one HVAC technician has comparable to another. You can only hope who ever the company sends is qualified to work on your system. Do you see a problem with that? Watch the video below for a more in depth view as to the differences from what it takes to be an AC technician versus a full fledged Licensed HVAC Contractor. I think this might surprise you. There is additional information in regards to 2015 EPA Regional Efficiency Standards as well as information on R22 Freon Ban in 2020 included in the video. Thank you for visiting with me today, I hope this information helps you make a wise decision.